I spent the weekend visiting my friend Anna in Waterville, Maine. 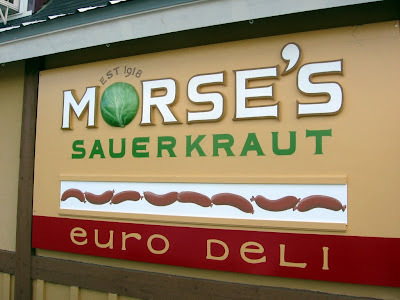 While driving along Route Three, we saw a sign for Morse's Sauerkraut. Strangely enough, both of us had recently heard about this place - me from Eating New England, Anna from a friend in her native state of Tennessee who had lamented his failure to tell her to bring him some sauerkraut on her trip home. Clearly, this is sauerkraut that inspires passion. The deli itself is amazing, full of European specialities that can be hard to find even in big cities, let alone on a back road off a two-lane highway in Maine. They have sausages and candies and cheeses and stroopwaffles. But most importantly, they have their own homemade sauerkraut. This is not the pasteurized, lifeless stuff you get at the supermarket. Sauerkraut is made through a process of fermentation, and the supermarket variety has had the process ended through the application of heat. But Morse's sauerkraut is still alive. That means that you can store it for some time, but you have to "burp" the container, because the gases that are the byproduct of fermentation will build up. So why would you want the bother of living sauerkraut? Well, it tastes better, for one thing. And living sauerkraut contains active enzymes that aid digestion, making nutrients more available to the body. There's a reason that every culture has a traditional fermented product that is consumed with meals, whether that be sauerkraut, kimchee, miso, pickles, or kefir. Of course, modern processing has ruined most traditional foods, eliminating the beneficial active enzymes in exchange for shelf-stability and uniformity. You can make your own sauerkraut at home, and it's not difficult, but it's nice to know that some commercial makers still care about providing a geniune food. If you can't get to Maine, Real Pickles in Montague, MA also makes its pickles and sauerkraut in the traditional way. Both Morse's and Real Pickles source their base ingredients locally, too. And the people at Morse's were awfully nice - they kept the shop open for us even though we arrived just as they were closing.